PRODUCT DESCRIPTION: Aerosol which has a very low odor and is applied much the same way one sprays a can of hair spray. 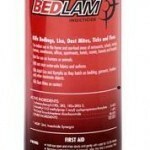 Bedlam is Non-Repellent to Bed Bugs, is water based and will not stain water safe fabrics and surfaces, and may be used on bedding and fabric, including curtains. (if you are unsure if a fabric is water safe, test in an inconspicuous surface before making an application.) Labeled on inanimate surfaces like suitcases. Not a bad idea to keep a can of this in your suitcase if you travel. Use it to treat hotel rooms prior to staying the night. Bedbugs have been making an overwhelming comeback in the past few years and have proven challenging pest in homes, hotels, dorms, apartments and many other types of structures. WHERE TO USE IT: Apply as a spot treatment to cracks and crevices on and around baseboards, floorboards, bed frames, wall hangings, headboards, furniture, door and window frames, millwork, and walls. Apply as a surface spray to carpet, mattresses, box springs, walls, furniture, bedding, floor and floor coverings, rugs, garments, luggage, closets, drapes, and window appointments. On mattresses concentrate on tufts, folds and seams. Allow spray to dry before replacing bedding. RATE OF APPLICATION: A can will treat several rooms if you need to use it all at one time but the good thing about this product is that you control the spray. This means you can use it to treat small areas several different times. The main feature is that Bedlam can last up to two weeks per application. This means that you will not need to treat every night. It is good when used in conjunction with a full bedbug program, or as a preventative when bringing in new furniture, moving, traveling, etc… Approximately 47% of all moving vans are infested with bed bugs!